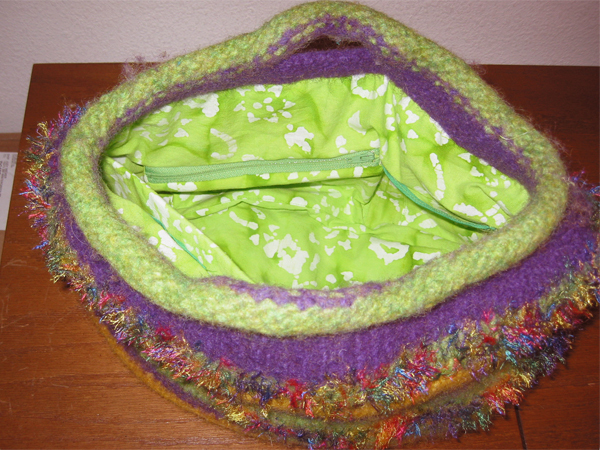 Being the good little knitter I am, I have finally, finally lined the funky felt tote bag. And there to the left is the proof! I accessorized the lining with a few pockets (one that zippers) and needle holders, and I included a divider that is attached only at the sides, so can be moved back and forth as needed. The felted tote now proudly joins the ranks of Finished Objects. 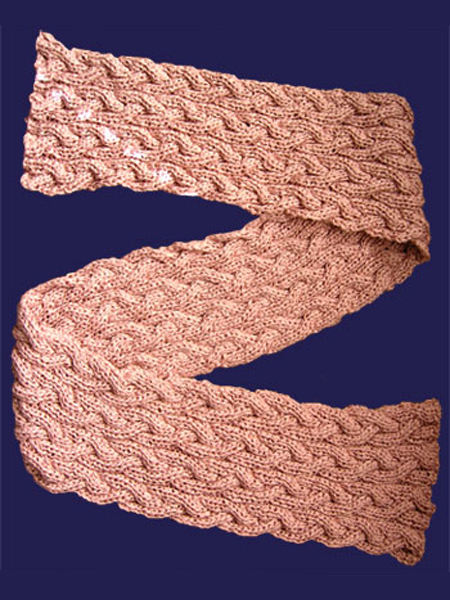 The pink cabled scarf is the “mystery project” started just before our road trip early this month. I cabled studiously through the entire road trip to make this gift for my friend L’s birthday. Today when we met for lunch her ESP must have been in high gear because, although she had no idea what her gift was (or even that it was knitted) she wore a perfectly matching pink blazer. Check in the Finished Objects Gallery to the right for the particulars on both these projects. #1 Son mentioned that he though the dark gray yarn I was planning to use for his gloves (promised last spring, but… well… the weather got warm) was maybe a little plain. I suggested adding a fair isle snowflake or somesuch to the back of the gloves because that sounded fun, and he liked that idea. When swatching, I just grabbed some other yarn from the stash to strand with the gray to check gauge, and what surfaced to try was some leftover Wildfoote sock yarn in variegated reds and oranges. Not quite standard, but it was striking. #1 Son liked the orange, so I picked up some orange in the same Frog Tree alpaca as the gray. I cast the gray alpaca on to my US#3 Clover circs. A few rows in, I realized I needed smaller needles for the wrist ribbing. Alpaca is so slick and slidey, I couldn’t imagine knitting it on Addi Turbos. In desperation, I hauled a pair of Inox Gray circs from the mothballs. I remember when I first tried the Inox I decided I didn’t like them. Now I’m wondering why. The gray surface isn’t nearly as slidey as most metal needles, although it doesn’t grab as well as bamboo. It’s somewhere in between. The joins, although they’re at a strange angle, are very smooth (and I’m picky about my joins). And the points are really, really sharp. I will never turn my nose up at these again!